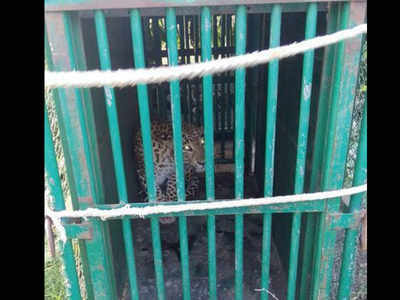 RAJKOT: A leopard that had killed two girls in Gir Somnath district over the past couple of weeks was finally caged in Sutrapada after much efforts by the forest department. A five-year-old girl was attacked in Moradia village of Sutrapada taluka Friday last when she was playing outside her home. Though villagers managed to release the girl from the grip of the leopard, she could not survive and died the next day. The same leopard had dragged an 18-month-old girl from her home in Motha village of Una taluka two days ago. The forest department had set six cages to trap this leopard, but got success only on Saturday.